El fuego representa el cambio, ya que es el elemento que permuta tierra, agua y viento. La artista nicaragüense Laura Báez de Lacayo sustrae su fuego interior y nos lanza la llama que arde en cada pieza que pinta, como parte integral del mismo elemento que representa. Una artista comprometida con la flama como lenguaje, está comprometida con la vida. Laura Báez de Lacayo reflexiona mediante sus pinturas al óleo sobre la paradoja del fuego a través de un examen muy personal con un sentido alquímico, porque enciende todo lo que toca, cuando la pasión arde en cualquier emprendimiento humano. El fuego en muchas culturas y mitos antiguos, es el purificador de la tierra mediante la quema del rastrojo, inflama el camino para la vida. No cualquier artista que juega con fuego sale incólume. Pero Báez de Lacayo prende una bengala con el fin de encontrar el camino que la conduce a una búsqueda en la que va dejando de lado las tradicionales formas de ver y pensar, porque este período ígneo no sólo la ha hecho reconocer su deuda con artistas de las primeras vanguardias como Boccioni o Duchamp, sino también con las entrañas de su propia tierra, lo que ha dado paso a otro innovador proyecto identitario que muy pronto presentará. 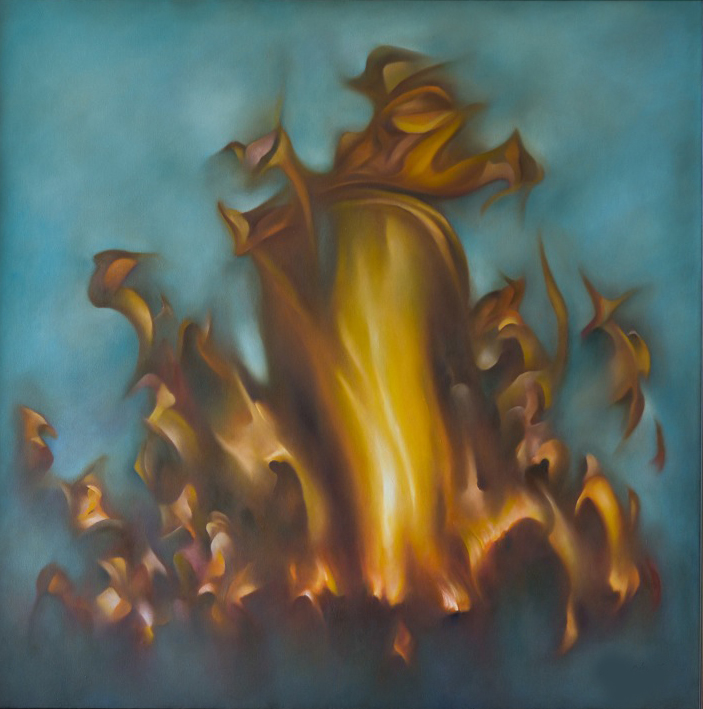 Báez de Lacayo, Llamarada, óleo sobre lienzo, 1.25 x 1.03, 2012. –Puede parecer difícil al principio, pero el movimiento se puede pintar con éxito a través de la observación de cómo se desplaza el fuego y notar los matices diferentes y las sombras arrojadas por su danza. En mi mente, la espiritualidad y el fuego son lo mismo, es un estado de perfección Divina que existe más allá del plano de la existencia humana. Es algo que todos tratamos de realizar en esta vida ya sea a través de las religiones o del más alto potencial humano, la imaginación;- dice Báez de Lacayo, mientras aviva su chispa, testigo de la independencia y la interdependencia de la vida. Como parte del proceso de su pintura, la artista hace estudio de campo y observa en silencio los matices de la hoguera que arde dentro y fuera de sí, permitiendo que la esencia del elemento se establezca. Algunas pinturas surgen boceteando sobre las llamas de un campamento, pero más a menudo se destilan en su mente para luego traducirlas sobre el lienzo en su taller, donde explora las relaciones entre el fuego, el medio con el que se expresa, ella misma y el espectador. 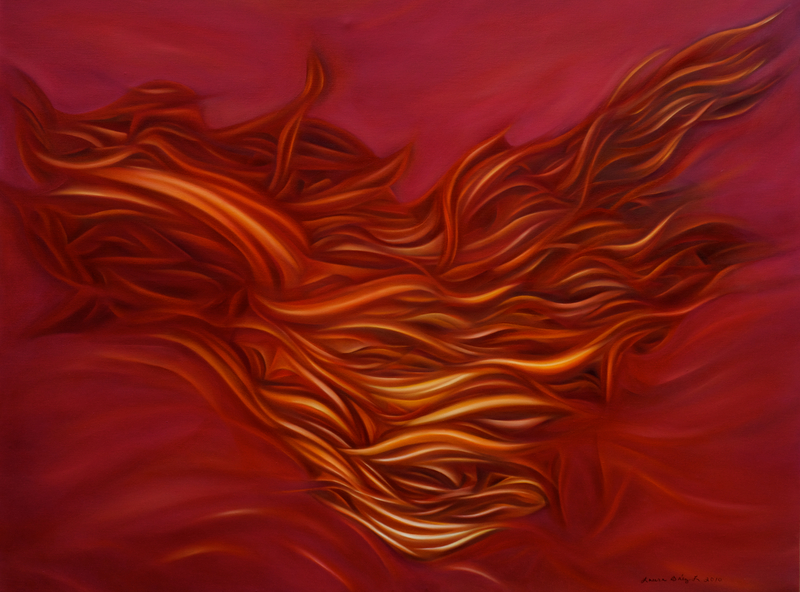 Báez de Lacayo, Fuego espiritual, óleo sobre tela,1.00 x 0.80 cms , 2012. La llama crece en oleadas hacia arriba, como si quisiera liberarse de la mecha que la sostiene y pudiera perderse en la energía que arde hacia los cielos. Pero incluso a medida que sus lenguas lamen el cielo, la llama ya está tirando hacia atrás, apretándose a la mecha y bebiendo con avidez del aceite en la lámpara – aceite que sustenta su existencia continuada, como una llama individual.- Y es esta tensión de las energías en conflicto, esta vacilación entre el fulgurar y el diluirse, que produce la luz. Báez de Lacayo concluye: -Pintar el fuego es pintar el alma, como la visión de una flama ardiente. Aunque es un fenómeno físico, la llama – luminosa, pura, etérea – es todo lo que la materia no es, de ahí su atractivo para el ser humano, un ser espiritual entrampado en un mundo material. Lacayo burns from her inside out; she is a changing manifestation of life, an artist committed to her Self. And when an artist devotes to Self, she devotes to Nature, is like a delivery to life. 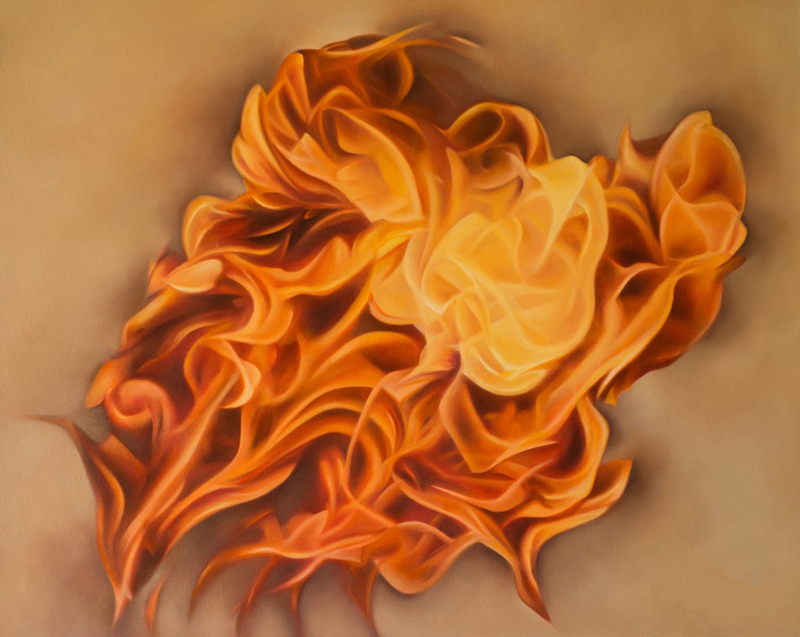 Laura Báez de Lacayo paintings reflects on fire’s paradox through a highly personal examination of the usage of fire in the practice of alchemy, in which the application of fire is a prime method of conversion, and everything that touches fire is changed, often beyond recognition. Fire in many ancient cultures and myths has been known to purify the land with the flames of destruction; however, it is also capable of the renewal of life through the warmth and comfort of those very same flames. Not many artists practice an incendiary approach to Self. But Báez de Lacayo lights a flare in order to find a new path and set forth toward a different goal. It is time to express herself freely and let go of the old outdated ways of thinking. 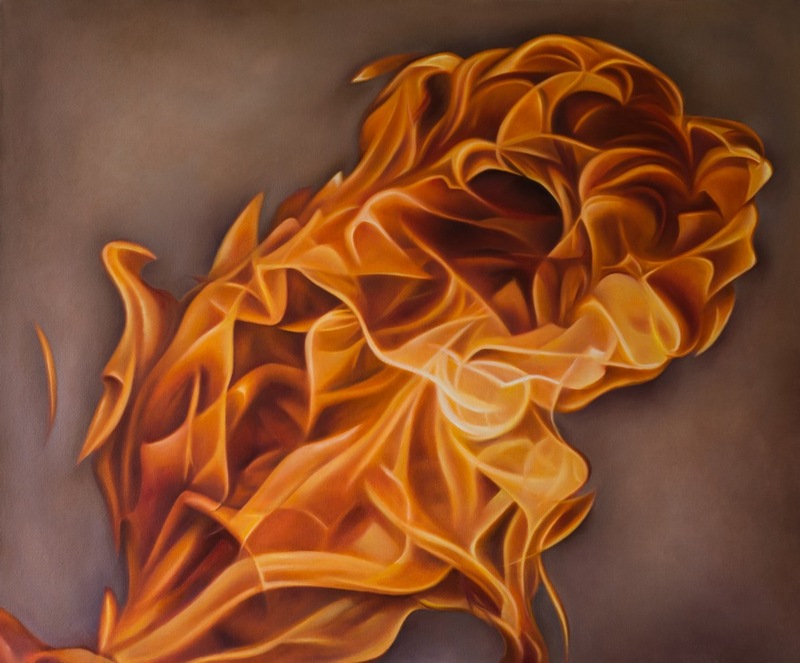 –Although it might seem challenging initially, movement can be successfully painted through observation of how fire moves and noticing the varying shades and shadows thrown by the movement. In my mind, spirit and fire are the same, is a state of divine perfection that exists beyond the human plane of existence. It is something we all strive to realize in this life whether it is through religion or the highest reaches of human potential. 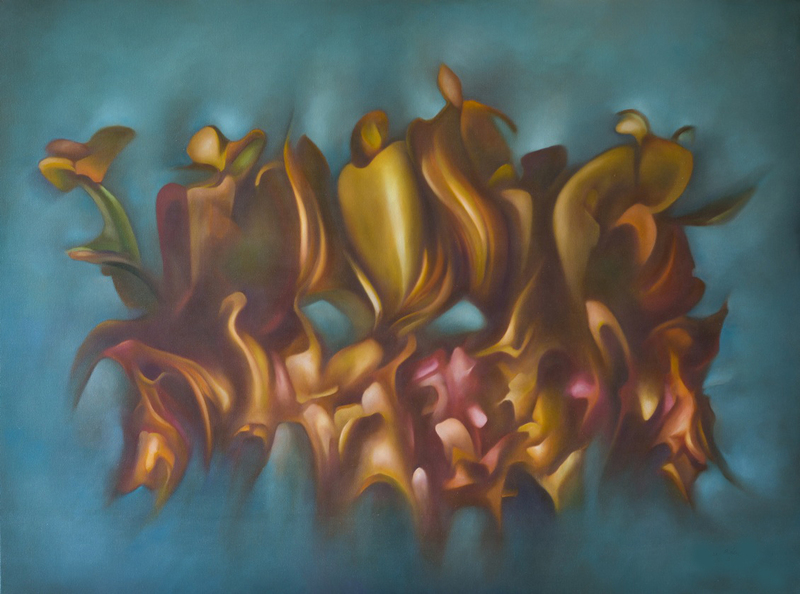 Báez de Lacayo, Ígneos II, óleo sobre lienzo, 2012. Báez de Lacayo ignites the spark. Through fire she witnesses the independence and interdependence of life. As part of the painting process, the artist creates field studies and quietly observes the nuances of bonfire. She allows the essence of the subject settle in. 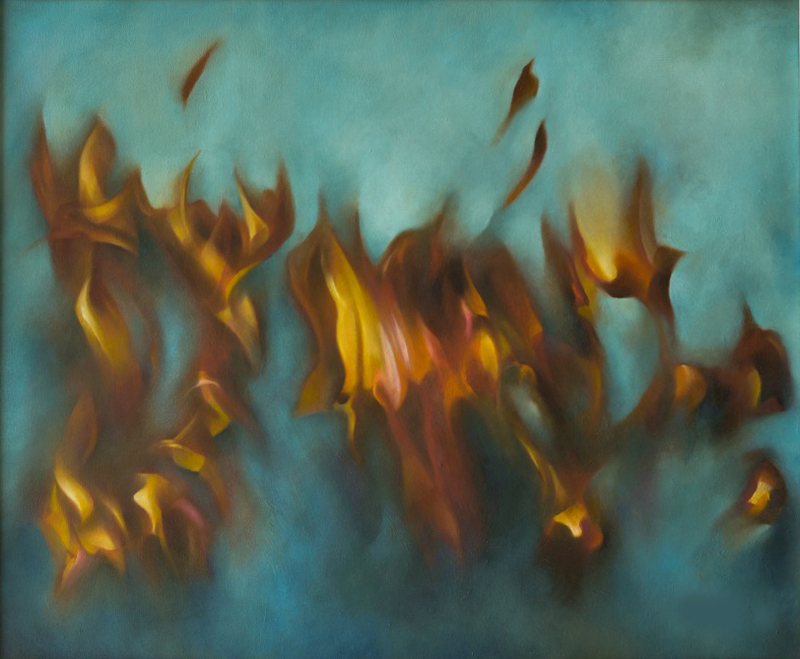 Some paintings are created watching camp fire, but more often they are distilled in her mind and then translated in the studio where she can explore relationships between fire, the medium, canvas, the subject and the viewer. This experience invites an additional relationship to form – one between the viewer and the image. –The power of the flame is neither male nor female but all and everything. – She declares. -As we are all created by the flame of soul, therefore we all believe in magic at some level. Somewhere in our souls is the knowledge that there is more than physical reality. The flame surges upwards, as if to tear free from the wick and lose itself in the great expanses of energy that gird the heavens. But even as it strains heavenward, the flame is already pulling back, tightening its grip on the wick and drinking thirstily of the oil in the lamp–oil that sustains its continued existence as an individual flame. And it is this tension of conflicting energies, this vacillation from being to dissolution and back again, that produces light. To paint fire is to paint the soul as the sight of a burning flame. Though a physical phenomenon, the flame — luminous, pure, ethereal — is everything the physical is not; hence its appeal to man, a spiritual being ensnared in a material world. Báez de Lacayo, Ígneos III, 1.22 x 91 cms. óleo sobre lienzo, 2012. LAURITA….FELICIDADES POR TAN LINDOS COMENTARIOS Q TE MERECES , HAS DEDICADO CON AMOR MUCHO TIEMPO A LA PINTURA ….FELICIDADES !!! !